In fact, both the press release and McDonald’s injunction are guilty of some inaccuracies and misleading statements. There was no meeting of either the council or the planning board on March 19, and the March 20 meeting of the planning board did not consider issues relating to the parkway widening. Rather, the March 19 action or document McDonald’s injunction refers to is an order by City Manager Jim Landon–an “administrative deviation” relating to the Wells Fargo property closer to the Palm Harbor shopping center. The order was signed by City Clerk Virginia Smith and Landon, but never formally approved by either planning board or city council. That’s not unusual, either, as such orders are at times carried out by the administration. Three laurel oaks are being removed by the city from in front of the Wells Fargo property, to McDonald’s dismay. In this case, it’s the city that’s purveying inaccurate information. At the Aug. 13 meeting of the city council (a workshop) Landon briefly talked about the removal or laurel oaks, there and further west on the Parkway, belittling opponents of the removal and predicting that once the city gets further west, there would be more complaints about such tree removal. Landon said that laurel oaks are quite different from live oaks, in that laurel oaks have a much more limited lifespan, that they age, become brittle and start shedding limbs as they die off–all accurate. But Landon put that lifespan at 30 to 40 years. That’s a straw man: the city is referring to something the McDonald injunction does not address. Rather, the McDonald injunction refers to the removal or cutting down of trees “on the premises of and surrounding the Palm Harbor Shopping Center in the Parkway East area of Palm Coast.” It refers to the potential of losing a canopy of mature trees–which, by the city’s own admission, is inevitable when older trees are replaced with younger trees, as will be the case even as the city replants more trees than it uproots. The handsome canopy may return, but not for many years. The city leave silent the fact that buffering square footage, now green, will be replaced by asphalt and concrete because of the widening. The council only briefly addressed the matter at a workshop Tuesday when Bill Reischmann, the city attorney, mentioned it. “The city will have many opportunities to aggressively challenge the substance and the way that the lawsuit is currently structured,” Reischmann said, stopping short of going further. So now Landon has added “tree expert” to his resume and overpaid and arrogant. Remember to vote people. Venting on Flagler Live is fun but it it won’t remove these clowns from office. Soldier on Dennis. Were it not for activists such as yourself big government would always prevail. There certainly is a need to expedite traffic flow. Try driving that section at any time other than midnight. Until the new I-95 interchange is completed, the parkway is the main evacuation route out of the city in an emergency. Remember the fires in the 90s when the population was minimal, compared to what is now. You tree huggers like McDonald should at least wait until there’s a plan presented by the city before working up a sweat. Maybe this reflects the distrust in Landon..
Mr. McDonald is absolutely correct. There are three plans relating to the drastic changes at Palm Harbor Shopping center. One of those plans will be submitted to the City, the most drastic of which will place the New Publix very close to Florida Park Drive. Gone are the setbacks mandated by ITT when Palm Coast was designed. 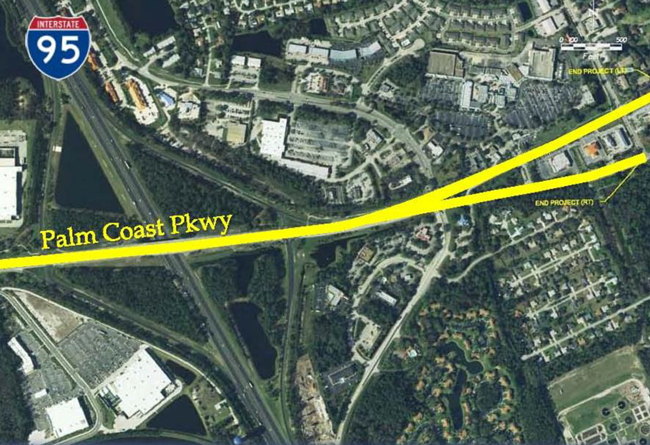 Wait until development takes place on Palm Coast parkway both Northeast and Southwest. Some 50 acres were sold to a prominent dentist. The Canopy will go and that pristine section will become a concrete jungle, just like Palm Coast West. Palm Coast will certainly lose its status as a Tree City. Just look at the drastic cutting of trees to make Town Center and the hospital’s campus expansion. BTW, how is a third lane to be added at the Parkway and Old kings Road as the liquor store was allowed to build right up to the easement?. Will there still be that dedicated right turn lane or will that disappear like the one at Boulder Rock Drive? Who approved that variance, the only variance like that all along Palm Coast Parkway. All other property along that parkway have the mandated setback. Perhaps that camera will have to be replaced. I am a proud Tree Hugger and why you ask. In this heat how many of us do not hesitate to look for shade or park our cars underneath a tree at a parking lot? How long would you last in this Florida heat without natures natural canopy? Lets meets in a parking lot. You in full sun and me underneath a shaded a tree and see who drops first. Then maybe you will realize the importance of trees. @ M&M: Tree huggers? Yes, and proud of it. That’s why I and others moved here, because of those very trees. There is a plan, you saw it in the other article. Interesting that the city chooses not to address the Covenants and Restrictions, when that is the most serious piece of this lawsuit. Distrust in the man who lent $8 million of our storm water fund to developers and then raised our rates? THAT Landon? That’s putting it mildly. Go get ’em, Mr. McDonald. Remove the Red Light Cameras, and save the trees! I believe it was that great American humorist Will Rogers who said “he never met a man he did not like”. He should have met Netts and Landon. That would have changed his mind! I know I live in Flagler Beach instead of Palm Coast, but I would love to have a beautiful successful thriving community next to ours. I just don’t understand the thinking of the decision makers there. Where is the complete vision of what Palm Coast will look like, and be like in the future? It appears that commission is blowing in the wind and yielding to pressures/enticements of developers (not business small owners), at every turn. Why is it just fine to build a high speed “Expressway” through the middle of the community to satisfy the big box stores. Should Palm Coast really be just one big shopping mall? Why aren’t those stores being added to the “Town Center” instead? Why is it that the Europen Village is slowly going bankrupt because no one can find them, (not only because of their silly “outside IN” design with the hidden entrance) BUT also because Palm Coast would not allow them real signage that helps spenders find the place??? Something is terribly wrong when it comes to developing the business community in Palm Coast. Huge roads and red light cameras are OK. . . but signs to help find the businesses are not. On top of that, with multiple lanes of traffic speed “through” Palm Coast, where are the children supposed to play safely? Where does the actual community of residents develop? Trees are often removed (in these kinds of situations) before plans are approved. . . OOPS! Once those mature shade trees are gone, they are gone forever! The time to act is now! I am a proud Tree Hugger. How many of us do not hesitate to look for shade during hot steamy days to stay cool or to park their car underneath a tree. Lets have an experiment, tree huggers vs. haters. We’ll meet in a hot steamy florida day at a parking lot. The tree huggers underneath the trees, protected by the wonderful shade they provide and the haters in full sun. Lets see who will drop first or crossover looking for shade. I wish the city would keep the trees in place, and remove the Red Light Cameras instead to add the extra lanes. I agree the road does not need to be widened. There’s not that much traffic. And that’s a beautiful area. I’d hate to lose any trees. How about letting them live until they die, naturally. We need new people running our city government. Less politicians with pockets to be filled. While our city keeps approving new condo resorts, last one in the Raccoon Island off of the little bridge overpass in Club House Drive, new sinkholes keep advancing in Florida and the reason is “overdevelopment”: Sometimes when the house makes cracking sounds and our lawn sinks here and there, I wonder. If there are laurel or live oaks involved, then no to any cutting. Work around it or just don’t do it. Another tree hugged here, especially in the summer. I will intentionally use parking lots that provide shade. I dread it when the Palm Harbour Shopping Center is “de-treed.” And regardless of how beautiful it will be as they promise, try parking under a Laurel Oak sapling. We tree hungers need to keep an eye on thee projects. to take a stand for us against these developers other than catering to them all the time ignoring our rights and have us also pay for consulting like the over $77,000 to a Canadian consultant to tell us what landowners and developers have the right to do in our Parkway East corridor. Sure nothing to benefit us. It can’t wait because the way things are done by the council in Palm Coast means that by the time those plans arepresented, the backroom deal is already set.